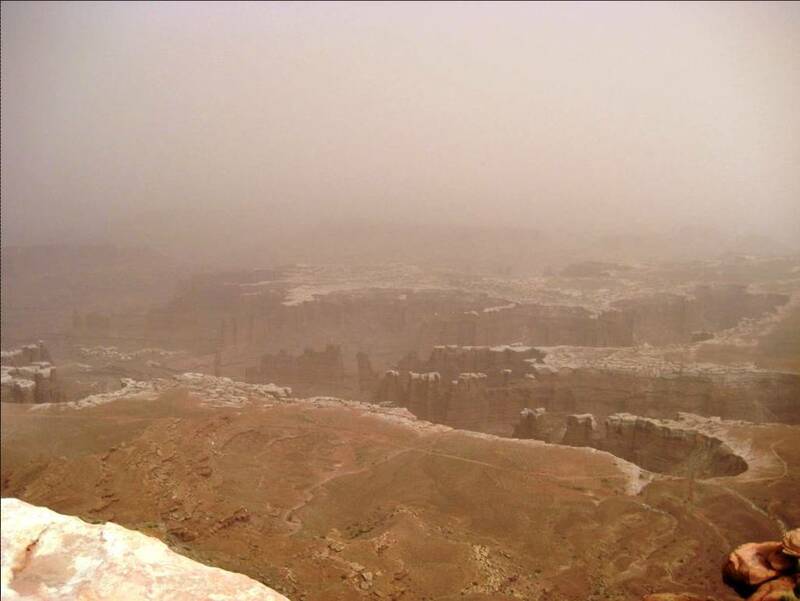 Colo./Utah Trip: To Sum Up – Dust Storms, Sandstone, Mountain Pies, Grande Mexican Food, and SNOW! Talk about “WOWS” (and holy cows). Have you ever seen how wind can shape sandstone? Arches National Park has a lot of examples and is an amaaaazing place full of color and incredible scenery. We spent some time there but because of high winds could not get the full effect since the dust obscured much of the view. It doesn’t show well in the pictures but there were spots where the sand was blue and green and red and coral and so on. Then on to Moab and lunch at La Hacienda Mexican restaurant. I utterly enjoyed the food – fresh and well prepared. Nothing fancy. Just GOOD. We’re looking down from 6,080 feet onto an elevation of 4,880 feet. On the trip back we re-crossed the Rocky Mountains and there was SNOW! I think the trip from east to west (Denver to Grand Junction) was more scenic but maybe that’s because I hadn’t been there before. John Denver songs were sung BRIEFLY on the trip out but on the trip back over the range, in between the static the music was mostly 70’s rock, country and some cool reggae-jazz. ‘Nuff said. I’ll blather about the poods in the next post. Promise! I finally sorted through the 150 pictures and created a PowerPoint show to share. You need PowerPoint to view it, though. I’m going to see if I can make a wmv file to share the pix via email. Let me know if you can’t view this (and want to) so I can send you an alternate version. Either way, I hope you enjoy it! I did. Click on the link below.